They’re considered by many to be 20th Century Antiques*. You really couldn’t ask for anything more in a bench, could you? Individual pieces of reclaimed Ox-Carts in Thailand are hand-cut to shape and then pieced together by expert crafts people to make this Curly Chunky Bench design. 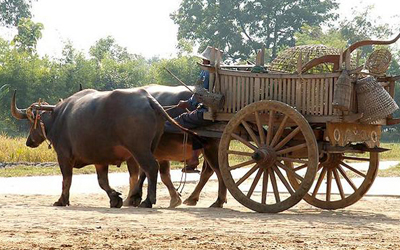 The attractive patterned design in the back rest is made up of the yokes that attach the Ox-Cart to the working ox. To be suitable for the rigours of Ox-cart use the teak has to be of the highest quality and this transferred to the Curly Chunky Bench once the timber has been reconditioned. This also means the bench is suitably protected for life outside all year round. Mortice and tenon joints reinforced with teak dowels make up the construction of the bench throughout, this makes the bench chunky and robust without any danger of an annoying wobble developing with regular use over time. 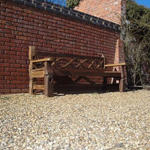 We sell a 1.4 metre Curly Chunky Bench for those smaller spaces. So different and comfortable also. Would recommend. Love this bench, each one is different and unique, and it sits well in my garden, driver was very friendly and polite and the Ann whom i spoke to was a delight to talk to. If i buy more of this furniture it will be from here as the can not fault the service, quality or price. Beautiful bench and comfy too! !